Tomorrow it is the 25th of March, the day in 1821 when the Greeks decided enough is enough, we want our independence. They were part of the Ottoman empire long enough. The war of Greek Independence lasted until 1932. The war started in Turkish held Moldavia when some troops invaded there. The troops were defeated but on March 25 the real fighting began on the Peloponnese, north of the gulf of Corinth and on several island. Within a year the rebels had gained control of the Peloponnese and in January 1822 they declared the independence of Greece. March 25 is both a national and religious holiday (Annunciation). March 25 is also the name day for Vangelis, Evangelos, Vangelio, Evangelia and Eva. On Skopelos students from the high school, the elementary school and the scouts will march from the mayor’s office until the entrance of the harbor. It will be a sunny day. Around 10.30 the students will get ready. At the war monument in front of the harbor some words will be said and wreaths will be laid down. After that the march will begin. Most shops and big supermarkets will be closed. Skopelos still has many kalivia/farmhouses and many people use them as a holiday house and fortunately the original furniture and other belonging are kept there. When you visit a kalivi/small farmhouse many items are so authentic of the life that Greeks live and used to live. A kalivi was used to spend the night(s) during the harvesting of the crops but more recently people spend weekends and holidays etc. there. There are always many beds available because the whole family would help out with harvesting and sometimes even friends would come and help. Bathrooms were not always present in the kalivi so washing up was done in the kitchen or outside. Coffee is very important in the life of a Greek and the tool to make a good Greek coffee is a briki/μπρικι. You don’t want to clean your shoes on these, they are sooo authentic! Everywhere photo’s of the family are scattered around and with those photographs stories are told. The shed is full of tools because you need them all when you are harvesting, pruning. No television is around, it is nice to talk. No other diversions than the nature. The photo’s are from a kalivi in Alikias. If you hear more noise than usual on the streets of Skopelos today, that is likely to be school students marking the anniversary of the 1973 student uprising at the Athens Polytechnic on Patission Street. What began as a spontaneous occupation to protest oppression by the junta of the Colonels became a much larger event as people rushed to the Polytechnic to support the students. The junta’s response was brutal, with an open-fire policy on protesters, culminating in a tank crashing through the gates of the Polytechnic and injuring and killing students who had climbed the gates as part of the occupation. By the time the smoke cleared days later at least 24 people, ranging from a 22-year-old Norwegian tourist who found herself in the wrong place at the wrong time to a 76-year-old housewife hit by a stray army bullet in her garden in the city centre, were dead. The students didn’t bring down the Colonels on their own, but international outcry destabilized the already unstable regime, which was riven with factions and interior mini-coups. Our esteemed colleague Damian Mac Con Uladh has done some commendable work researching the history of the events, and you can read some of it here. A reminder that today, October 28, almost everything across Greece apart from bars, cafes and restaurants will be closed for the annual celebration of Ohi (‘No’) Day. The day is usually marked on Skopelos with a parade by Scouts and a formal ceremony by civic and military officials on the paralia, shortly after 11am, although this year there are persistent forecasts of bad weather that may disrupt events. 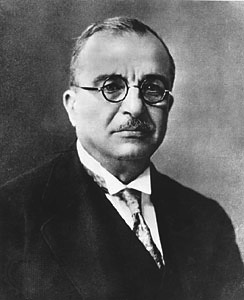 Unreliable history claims that this was the day in 1940 when, at a party at the German embassy in Athens, then prime minister Ioannis Metaxas was presented with an ultimatum by the Italian ambassador to either allow Axis troops to enter Greece to adopt ‘strategic locations’ or be invaded. Metaxas probably didn’t reply, ‘Ohi’, although it became a popular Greek myth. Raised on the Italophone islands of Ithaca and Kefalonia, and himself a recent political exile in Italy, he would probably have replied in Italian, although another apocryphal history claims he actually said, ‘Alors, c’est la guerre!’ (‘Then, it’s war!’). Either way, Italian troops invaded from Albania at 6am the next morning, suggesting they already had their own ideas regardless of what Metaxas said at that party. As the dictator at the head of the 1936 4th of August Regime, installed after a coup led by Metaxas himself, he is described by noted historian Richard Clogg as an admirer of Hitler and Mussolini, and was responsible for exiling thousands to the islands. Yet it’s also said he introduced the minimum wage, unemployment benefit, maternity leave, the 40-hour week and the two-week paid holiday. Alas, he died a few months after the Italian invasion and a few before the Nazis rolled into Athens and set about proving that his support for Hitler was the teensiest bit of a mistake. More than 332,572 Greeks have emigrated abroad since 2010, at the onset of the economic crisis, says a General Secretariat for Greeks Abroad report. The data is compiled from figures coming from the migration authorities of the countries where Greeks have emigrated. The report notes that there is no obligatory registration process of Greeks living abroad to local Greek ambassadorial and consular authorities, while it underlines that these figures are close to the real number, but not precise, and illustrate the reality of Greeks who were forced to emigrate. A previous study conducted by the Bank of Greece estimated the number of Greek emigrants during recession to about 420,000. The vast majority of Greeks seeking employment went to Germany (157,055). Next is the United Kingdom, a choice of 51,859 Greeks with Australia coming third, accommodating 45,000 migrants from Greece. Cyprus comes next as the choice of 31,474 Greeks. Norway is next with 9,901 Greek emigrants, 8,000 chose the Netherlands, 6,340 went to the U.SA., 6,165 in Austria, 5,000 in Switzerland, 5,000 in Belgium. The United Arab Emirates hosted 1,852 Greeks, Canada 1,616, Denmark 1,419, Qatar 650, Kuwait 500, Luxembourg 464, Portugal 248 and Cuba 29. It should be noted that there are no data for other European states including France, Sweden, Finland, Spain, Italy, Ireland, Bulgaria, Romania and other countries. A nationwide general strike on Thursday 4 February, combined with another 48-hour strike by the seamen’s union PNO over Thursday and Friday, is likely to cause disruption throughout Greece. Both strikes are in protest against punitive changes in Greek welfare and pension provisions. The general strike is likely to close many offices and perhaps even shops on Thursday, while the seamen’s strike will leave most ferries port-bound. However, we did notice that the Proteus sailed during last week’s two-day PNO strike.